1. 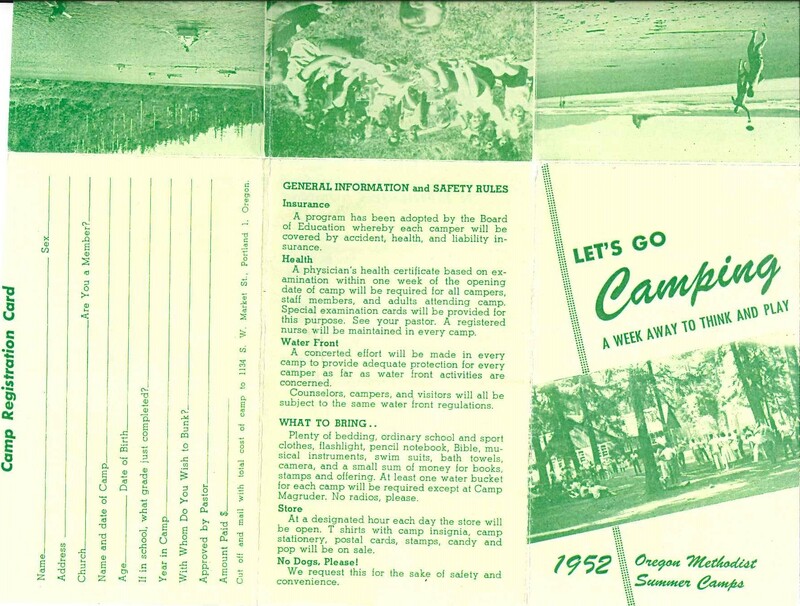 There were three camps listed: Camp Magruder, Suttle Lake Camp, and... Camp Myrtlewood? 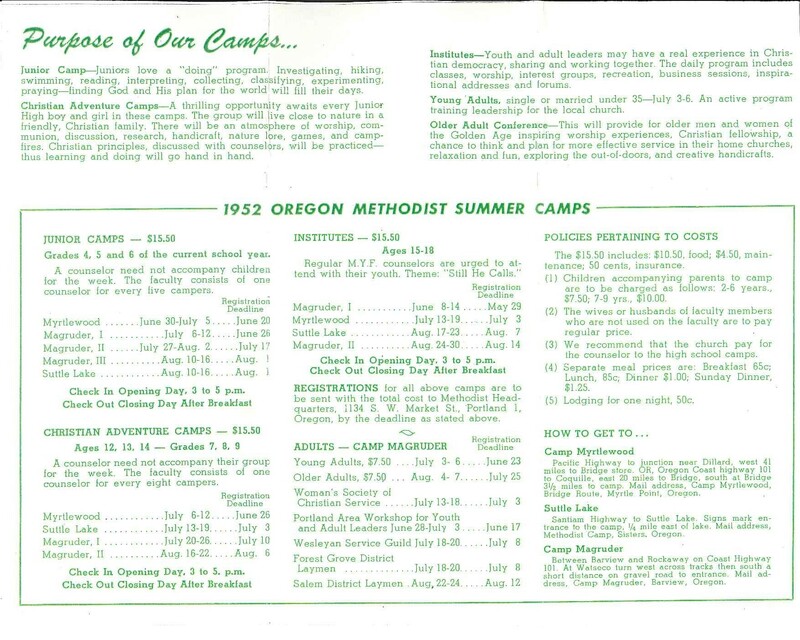 For a few years prior to Camp Latgawa's purchase in 1953, the Oregon Methodists rented space at Camp Myrtlewood, a Church of the Brethren camp near Myrtle Point for three weeks during the summer. This camp is still in operation by the historic peace church to this day! 2. Although we now have adventure camps for all ages, the description of "Christian Adventure Camps" still applies: "A thrilling opportunity awaits every Junior High boy and girl in these camps. The group will live close to nature in a friendly, Christian family. There will be an atmosphere of worship, communion, discussion, research, handicraft, nature lore, games, and campfires. Christian principles, discussed with counselors, will be practiced - thus learning and doing will go hand in hand." 4. On that same list, a simple request showed that we were just beginning to enter into an era of digital distraction to which camps were seeking to be an alternative: "No radios, please." I get goosebumps when I consider the generations of children, youth and adults, who have sat around the same campfire circles or looked at the same moon reflected in the same waters, sharing their stories and their hopes and dreams for their world. It is important to look back on these years seminal to the foundation of Camp and Retreat Ministries every once in a while. I give thanks to God for the foresight of visionaries who knew that our connection to Jesus through deep relationships in the wilderness would become such an important part of creating disciples in our region. It has (can I get an "Amen!"? ), and with your contribution to the Joy Fund for camp scholarships or to any of the development funds of Camp and Retreat Ministries, it will continue for many, many years to come.